As an avid cigar smoker and connoisseur, the cigar shops and lounges of Ybor City are like a second home for me, especially King Corona. The Corona is a place to escape and disconnect from the world. Smoking a mild Dominican Arturo Fuente cigar and enjoying a cup of freshcafé con leche brewed by the owner’s wife, Brenda, is a bi-weekly ritual for me. In fact, I consider my cigar and café con leche to be my therapists. While I may not speak to them, I introspect enough for them to understand me and alleviate my 50 and 60-hour work weeks. The fresh smell of tobacco and cedar along with the constant brewing of espressos is a form of aromatherapy. For years, the Corona has been my go-to destination for these so-called therapy sessions until a couple of weeks ago when I decided to visit Davidoff of Geneva, a cigar shop a few miles west of Ybor City. This lounge had been recommended to me and brought up in conversations several times in the past, but I just never had the urge to go and felt as if I were being unfaithful to the Corona if I did. The lounge itself was something out of this world. Its architecture was more modern and updated than King Corona’s. The ceilings were extraordinarily high like those of a Gothic cathedral. The selection of cigars was vast and seemed like an endless indoor plantation compared to the Corona, a small “mom-and-pop” store. In addition to high ceilings and a larger selection of cigars, there was a bar, which emulated a high-reaching bookshelf in an Ivy League law library. The bar even had its own ladder to navigate up and down and from end to end of the shelf. It offered several unique bottles of alcohol upwards of $5,000. One bottle in particular, of pre-embargo Cuban rum, was priced at $15,000. With high ceilings, a large selection of cigars and an elaborate bar came the savvy and elegant workers at Davidoff. The workers were avid cigar smokers and connoisseur. They were living, breathing cigar encyclopedias with the ability to recite the entire rolling and aging process for almost every cigar in their store. They wore white, long-sleeve guayaberas, the traditional formal dress shirt for Hispanic Caribbean men. The shirt is characterized by its four front pockets, two up top and two down below before the waistline, making a square shaped pattern. The pockets serve a very functional purpose: holding cigars. I was enthralled by the atmosphere at Davidoff, and I began small talk with one of the workers, named Oscar. I started the conversation by asking Oscar about the history of Davidoff of Geneva. Long behold its origins are Swiss. Much like Swiss watches, Swiss cigars — Davidoff cigars – are some of the finest in the world. A Davidoff cigar is the “Rolls Royce” of the cigar world, according to Oscar. He surprised me when he told me that these cigars are thought to be better than Cuban cigars, and their prices are a testament to that. I saw cigars priced as low as $20 and high as $500 for a pre-embargo Cuban cigar that’s been aged for over five decades. Now, Davidoff cigars are actually moderately priced; most run from $20-50. 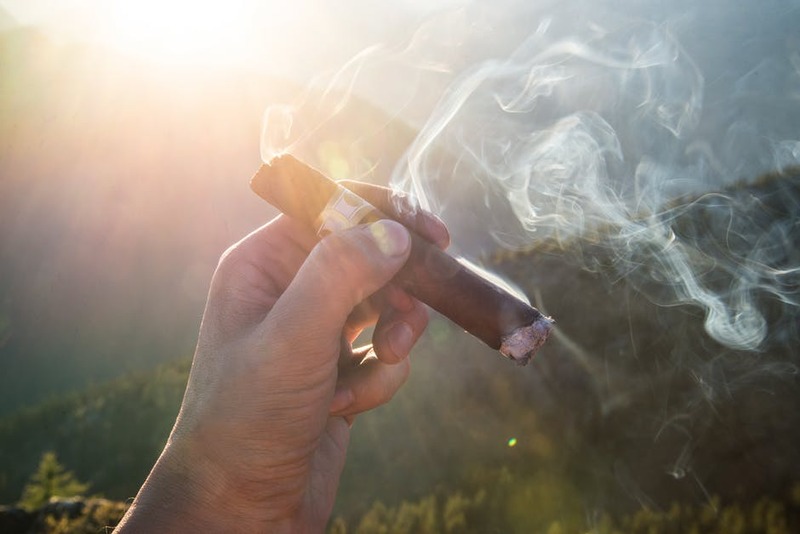 With a higher price comes a higher quality cigar and overall better smoking experience, so there is a direct correlation between price and quality. Oscar even convinced me to buy a $27 cigar. It was Davidoff’s 20th anniversary edition cigar, grown here in Florida with Cuban tobacco seeds. Its outer wrapper was a dark brown hue with a pointed shape, or what we cigar smokers call a “torpedo.” Its bands were white with gold embossed lettering, and placed toward the pointed end of the cigar. The white bands with their gold embossed lettering gave the cigar a presence of elegance, much like a white dinner coat on a man dressed for a formal evening event. At first glance, spending $27 on a cigar seemed outrageous and like a waste of money, but after smoking it, I soon realized it was worth every penny and puff. The smoking experience itself was divine. Every puff was sensational. I never had to relight nor ash it until halfway through my smoke. The burning ash was a hue of white and light grey. These characteristics are crystal clear indicators of a finely wrapped, quality cigar. Much like the workers, the people who frequent Davidoff were quite intriguing as well. Most seemed to be businessmen, clearly indicated by their pinstriped slacks, French cuff dress shirts, and their glasses of bourbon. As I was enjoying my $27 cigar, I noticed a bald middle-aged man with a salt and pepper beard and hipster-like black frame glasses. This gave him a very professorial look. It gave the impression that he was someone who I can have an intelligent conversation with and learn from. After subtly observing what drink he was being served by the beautiful waitress and what cigar he was smoking, I approached him and asked if I could sit next to him. His initial reaction seemed a bit stunned and puzzled as if a stranger like myself had never asked to sit with him while smoking a cigar, but after a moment of awkward pause he said yes. I asked the gentleman his name and what he does for a living. His name was Steven Tresser, a neurosurgeon here in Tampa. Dr. Tresser was smoking a very dark cigar or what we call a “maduro.” Maduro means mature in Spanish, meaning the tobacco leaf was hung longer or aged more than others before being wrapped into a cigar. Its color at first glance seemed like the type of cigar that was shortening his quality of life by 10 years with every puff. They’re the type of cigars that put “hair on your chest” per se. Ten minutes into sitting together and smoking cigars, I learned that Dr. Tresser had just performed an eight-hour craniotomy, a surgery that involves removing one’s scalp and a part of their skull to have direct contact with the patient’s brain. His eyes looked strained from the eight hours of stringent focus. His hands were quite relaxed with a light hue of red from using them to perform a surgery that saved someone’s life. Like myself, a cigar is his muse. It’s his escape from the chaos of an operating room. And like myself, Dr. Tresser used to frequent a mom-and-pop shop, but Davidoff has become his new second-home. Luciano Perdomo can be reached at lucianoperdomo174@gmail.com.